Serverplan Review 2019: Is Serverplan a Good Hosting? Serverplan is a leading Italian provider of web hosting, managed VPS, cloud hosting, and dedicated servers. It has a clear focus on improving its customers’ productivity. Serverplan was established in 2002 with the aim of providing high quality, affordable web hosting services to the Italian market. It envisioned making a difference in the hosting industry based on an individual customer approach. Its website and services are offered in the Italian and English languages. This company employs the most advanced modern technologies and (literally) employs the most highly qualified technical support staff to ensure you high-performance hosting and unbeatable 99.99% uptime. Serverplan’s Linux hosting plans use the cPanel control panel, and its Windows plans use Plesk. The popular cPanel, in particular, helps you configure your website in a matter of minutes. 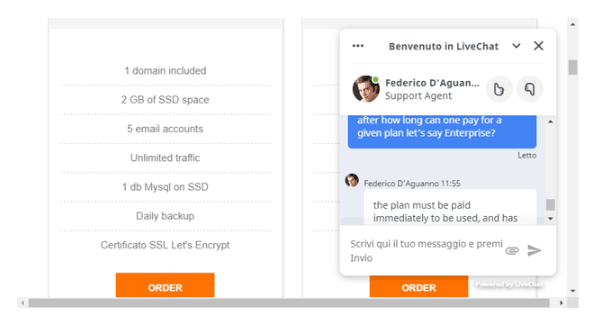 The Easyapp one-click installer (in Italian) will get your WordPress, Joomla, Magento, or PrestaShop CMS installed in no time at all, and they also offer a free migration system to move you from your previous CMS host. Serverplan offers four Linux web hosting plans and three Windows hosting plans at very competitive prices, with the high-end packages obviously providing higher resource allocations. Customers can upgrade their plans at any time simply by paying the difference in price, and without suffering any downtime. You can pay via popular methods such as credit cards, PayPal, wire transfer, and even by post, and the 30-day money-back guarantee gives you the opportunity of getting out within the first month if it all goes wrong. You can access Serverplan’s highly rated 24/7/365 “Intrepid Support” (their words) via telephone, ticket, and live chat. I can personally attest to the quality of the support after testing both their live chat and email support options. I found that Serverplan’s knowledgeable and efficient support agents took an individual approach to every inquiry. If you prefer to support yourself, you’ll be pleased to hear that this vendor’s knowledge base is one of the most comprehensive I have come across. Serverplan is an Italian web host providing high quality, reliably fast, and high performing web hosting solutions that cater to everything from personal blogs to corporate websites. If you’re interested in Italian hosting, get your website served by Serverplan. Wondering how Serverplan stacks up against other Web Hosting companies? Enter any other Web Hosting company and we will give you a side-by-side comparison.